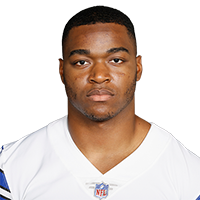 Published: Jan. 5, 2019 at 10:54 p.m.
Dallas Cowboys wide receiver Amari Cooper lays out for a tough grab for 27 yards. Published: Dec. 9, 2018 at 07:17 p.m.
Dallas Cowboys quarterback Dak Prescott airs it out to wide receiver Amari Cooper for a 75-yard touchdown pass. Published: Dec. 9, 2018 at 07:04 p.m.
Dallas Cowboys wide receiver Amari Cooper beats Philadelphia Eagles cornerback Sidney Jones for the go-ahead touchdown.